Some information about the harps which I play. This is the beautiful cherry wood harp that I take out into the Dene, and all the other wild places that I make music and essences. My harp was made by Raphael Weisman at Harps of Lorien. Their harps are beautiful - in sound, crafting and energy. Mine is a Raphael 26 Therapy Harp. This harp has a beautiful resonance for its size. This is the sound you will hear on this page, and on most of the live recordings of harp music in nature which are on my albums. I love this harp - with sacred inscriptions inside the sound board, it has been made with love. It is my constant companion. Or contact Julie for more information. Contact Julie here for more information or to place an order. harp which arrived in the UK last week. This is the joyful moment of their meeting! 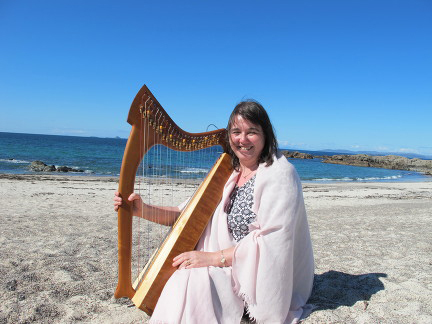 There is a growing community of Lorien Harps here - people who have fallen in love with the beauty of the harp sound and the love with which these instruments are made. This is my floor standing harp - a lever harp that has a bigger sound for times when I need that. 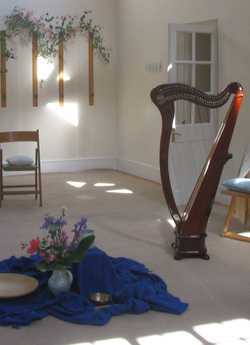 It is a Carolan harp, from Clive Morley - a highly respected company. I don't think this particular model is available now. This is the first harp that I owned. I still love the beautiful resonance and tone of this lovely harp.